Maren Jonette Pedersdatter was born at Benerud in Eidsvoll, Norway, daughter of Peder Pedersen and Anne Soffie Jonsdatter. She was baptized and confirmed in the Eidsvoll Church and attended realskole at Eidsvoll. When old enough she spent summers up on the saeter where the cows had been taken to graze, and she had to milk them and churn the cream into butter. 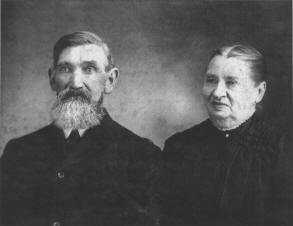 She became engaged to Carl Olson (1846-1929), who had walked from Arvika, Sweden and worked as a hired hand at Vestgam. He came to Sparta, Wisconsin with Maren’s brother Anton in 1871, and Maren came in 1872. She worked in Sparta until she and Carl were married at Portland Center Apri1 15, 1873. In 1875 they moved to a farm in the Cleavedahlen area, where they lived for 50 years. Maren and Carl Olson had six children: Annie, Mrs. Albert Olson (1874-1964); Ole (1876-1952); Peter (1878- 1957); Caroline (1879-1965); Martina (1881- 1960); and Christian (1885-1970).